I am finally going to write about this, because if I wait any longer, I'll forget the details. I will get the negative part out of the way first: I really did not finish with a time I'm proud of. I know I said that my goal was "just to finish," but I am really not happy with my time. I was hoping to finish around 2:35 but ended up finishing at 2:51. Almost 3 hours. Granted, there were a lot of hills, like A LOT OF HILLS, none of which I ran up in order to conserve energy -- that's probably what did it -- but still. Still. On the upside: I ran a half marathon! I did it! 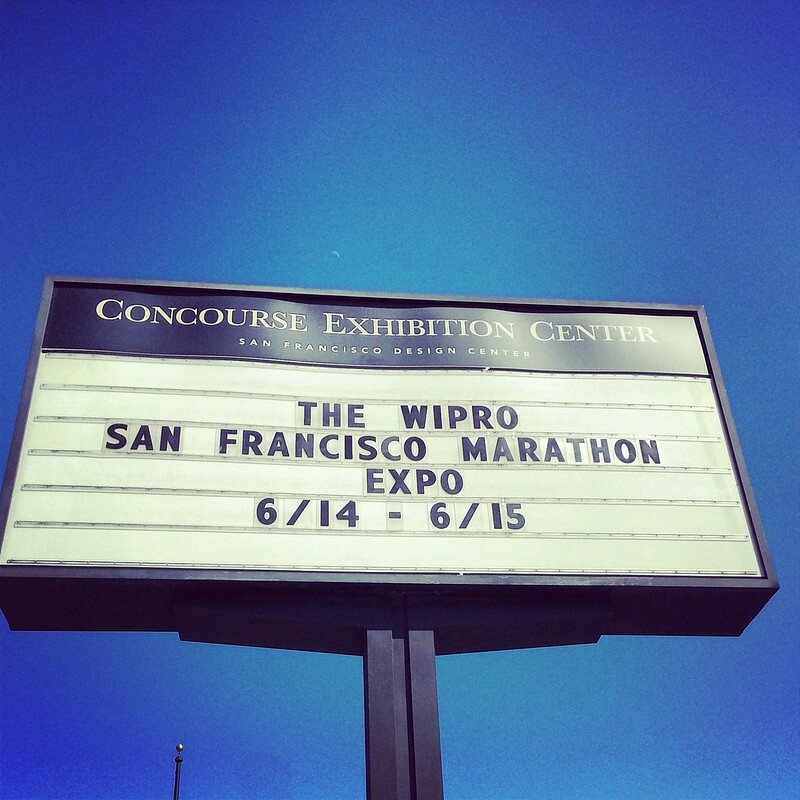 The a few days before the half, I went to the SF Marathon Expo to pick up my bib, race shirt, and bag. I did my last run before the half on this day, as it was exactly 2 miles round trip from my house to the expo. I am not a huge fan of all the commercialism at the expo,but that's kind of what it's there for, and as long as people leave me alone and I can walk through the concourse looking at all the pretty shoes etc I don't mind. It struck me very much as I walked the floor this year how different I had felt just one year ago, when I came to the expo to pick up my 5k/Progressive Marathon materials. I never could have imagined last summer that I'd be running a half marathon this year, or ever. The night before the half, I decided I needed 8 hours of sleep. I know, novel, right? So I cooked up a batch of pasta (for dinner), a batch of tofu scramble (for breakfast), and managed to go to sleep at 8pm. Here I really must call out my wonderful husband for being so supportive -- even though it basically meant he couldn't do anything that was noisy or might wake me up after 8pm (he was up until 2am!). The alarm went off at 4am. I stumbled around. I force-fed myself water, coffee & a breakfast burrito stuffed with tofu scramble. I knew I needed to eat -- but it was awful. I felt incredibly nauseous, like I'm about to throw up nauseous, for at least an hour, if not more. It was just from eating too early in the morning. I am not a person who can wake up and eat breakfast right away, so it was jarring to my system. I got dressed, pinned my bib on and left the house at 5:40am. Since I did the first half marathon, the start line was within walking distance of my house at the ferry building, so I got to enjoy a leisurely early morning walk as the sun rose to my right. It was beautiful. I arrived at the start line, discarded my coat & got ready. I'm going to recap things by mile now, since running is a ridiculously mental sport and things change a lot over the course of 13.1 miles, and man, was this ever the epic journey. Miles 1-4: I ran the entire time during the first four miles, with the exception of the first hill ascent (Ft. Mason). Feeling pretty good at this point, which was probably due to the adrenaline, my huge breakfast & all that sleep the night before. It's amazing what a difference those things make, I'm telling you. It became clear that it would be a beautiful day, and people began lining the road and cheering for us. Mile 5-6: I began to feel exhausted for the first time, and my right leg, hamstrings and quads alike, got really stiff. This has never happened to me before -- not like this -- so I began to worry, but tried to put it out of my mind. I was still really nauseous at this point, too. I kept going but unfortunately had to slow down. As we went through Crissy Field, I walked part of the way & tried to make my leg feel better, to no avail. Right before we climbed to the Golden Gate Bridge, I made the executive decision to stop for a few minutes and really stretch and massage my legs. This turned out to be a really good decision because my leg no longer bothered me after I did this! Miles 7-9: These were the GG Bridge miles. I knew that they were going to be tough because I'd run the bridge before, and it literally is an example of "uphill both ways." Plus, since we were running in the road, there were all kinds of interesting things to watch out for and avoid. The Golden Gate takes no prisoners: I saw multiple people fall while running across this bridge. I ended up walking quite a bit on the uphill bits, knowing I had a lot of miles left to go, but I have a rule called "never walk when going downhill," so I definitely pushed it on those parts. I had some Gu energy gel at mile 8 or so. On the way back over the bridge, I had my biggest mental breakdown when I saw a girl REALLY fall and eat it -- she was face down, being tended to by others, but she was covered in blood, on her face, her legs, you name it; and our eyes met as I ran by. She looked confused and absolutely miserable. I have to admit -- this really freaked me out. I am a really clumsy person, and I've fallen while running before, and at that moment I realized just how many things on the bridge there are to trip on when you're running and not in a car. I got out of my head for a while and really had to talk myself back down from the ledge. I was freaked. I didn't want it to be me. The image of her looking at me with her confused, bloody face haunts me now still. Miles 10-11: This was where the weather began to go bad; I had no idea this was going to happen and was really surprised! The Presidio was socked in with fog, and it was freezing. There were also a lot of hills here, and I began to realize that I wasn't going to make my time. But still: 10 miles! Yes! I recognized that I had actually been through this part of the Presidio before, when I went on my hike in May. It was beautiful looking down upon Baker Beach with all the fog around it. Miles 12-13: We were going up hills and down hills pretty consistently during this time, now through the residential areas of the Outer Richmond. I pretty much had to walk up the hills at this point -- all of them -- but I ran as much as I could, and we were all being cheered on by people in their apartments, and the event volunteers who always said "It's all downhill from here" as we crested a hill (guess what? They were always lying, but I totally forgive them ... they gave me hope). We descended into Golden Gate Park around Mile 13 and approached the finish line. 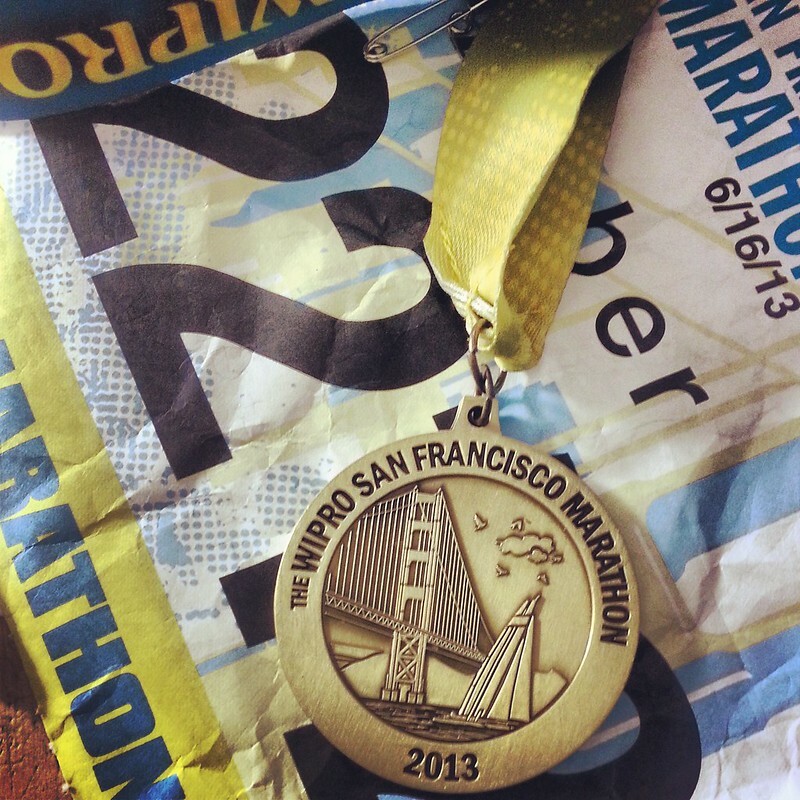 Mile 13.1: When I saw the finish line up ahead, I couldn't help it: I cried. I did it. I had done it. Somehow I ran 13.1 miles! I thought of all those who I was running for: my dad, Steve, Karen. I can't even express how proud of myself I felt in that moment, as I crossed the finish line & collected my medal, tarp, etc. I even overlooked my finish time with all the euphoric chemicals running through my body. I immediately texted Scott & my mom to let them know I DID IT! & went immediately to the Irish Coffee station. I also ate a couple of bananas, then made my way, shivering in the freezing cold now while waiting in line for the bus that would take me back to the ferry building. I ended up walking home from the ferry building, still totally freezing, but warmed up considerably after arriving home & eating some food, taking a shower and collapsing for a series of naps. They were naps well deserved, my husband loves me and was so proud of me that day ... and the next day? My birthday. It was a really good day. And like I said above: I have unfinished business. I want to do it again. Well done, Amber! That's phenomenal you finished it. I know that course is super hilly, so good for you for doing it. Are you going to tackle the second half next year? You're amazing and I'm so so so proud of you. The first is always a trial. You WILL do it again and you WILL rock it. You can blame it on me!